Now that Garmin recently updated their Connect software to allow its users the ability to sync with MyFitnessPal it was time for me to give the Vivofit another look. And with the first day of summer behind us people are finding more time to be outside and get active. With some fresh faces in the fitness wearables market how do the Garmin Vivofit and Fitbit Flex continue to stack up for the Summer of 2014? Just last week I posted up a new blog article where I compared the Garmin Vivofit to some new devices from Striiv and Withings. At that point I had completely dismissed the Garmin because of the lack of MyFitnessPal integration, a feature I felt was paramount for me. Naturally then just days later they unveiled support for this and mucked up my whole review. And here we are! There are still plenty of differences between the Vivofit and the Fitbit Flex, both which are devices you’ve seen mentioned regularly in my blog. Technically this is also a follow-up review, since my first ‘encounter’ with the Garmin Vivofit actually appeared HERE when the device was newer to market. Since there are already some great reviews of the Vivofit out there (and I suggest you seek them out and educate yourself before purchase), my goal here is just to cover the major differences that consumers should be most aware of during their research and purchase — and to discuss how these two fit into my lifestyle. Unlike my other shoot-outs, the layout here is more of a quick down-and-dirty of these two great devices and how they compare. Both devices have good apps (as tested on my iPhone 5S) and also cloud-based web portals to view data. Both of them integrate with MFP. And both of them are snazzy looking. So why would you take one over the other, besides the obvious $30 savings? That will depend on how you intend to use the device, and how fitness-minded you plan to be. If you have ZERO need for a heart rate monitor (cardiovascular exercise data) then the Garmin Vivofit‘s only advantage is that of a display. And in doing so you also manage to lose the vibration features the Fitbit Flex silent alarms offer. For someone who simply wants to lose weight, then the Flex works fine. But if down the road you want a heart rate monitor you have to break out your phone and use your app-of-choice. I recently wrote an article talking about the latest Wahoo heart rate monitors and using them. Still, the scalability option exists, so just know the limitations. This works fine, but now suddenly you have a Fitbit for daily steps, but still need another device and your phone to record working out. And this is where the Vivofit really shines. During your workout the Garmin displays your BPM and heart zone vitals without your phone needing to be in reach. And best of all you also can easily bring any ANT+ heart rate monitor to the table and record your cardio workouts. That feature alone (plus display) more than justifies the $30 premium. (I recommend the new Wahoo TICKR HRM device). But there are definitely trade-offs in this comparison. If you’re the kind of person who doesn’t want to have to remember to sync, the Flex just does it all for you. With the Flex you get a sort of passive approach. You don’t have a screen facing you reminding you of your activity (or lack of). It has a simple and reliable app that syncs in the background constantly. It doesn’t nudge you to do anything, no red bars to remind you to workout. You just go on living your life and if you want to check your activity, the data is there at a moments notice. I’m also fond of their future plans to integrate into clothing and jewelry. On the other hand the Garmin Vivofit is undoubtedly geared more towards those who want to take this whole fitness experience a bit more seriously. That isn’t to say the Fitbit isn’t serious, but the fact that Garmin built heart rate support right into their unit goes a long way to explaining how they expect their clients to use the device. They have designed the manual sync expecting you are a bit more gung-ho and since you’re going to probably use an HRM– you won’t mind this more hands-on approach. Compared to the article from last week you don’t get text/phone alerts on either of these devices, and there is no built in resting-heart-rate sensor. But for many people those are just gimmicks or features they don’t need. And considering it the Garmin seems to be more commonly sold at fitness stores, and Garmin is known to those circles, that is where I think the Vivofit really shines. Their success hinges on their prior GPS running watches, and existing customers making the transition. Even for new customers, though, it is hard to ignore the fitness focus the Garmin device has brought to the table. In conclusion then, I don’t think you can go wrong with EITHER device. If you end up getting serious about cardio exercise, even with the Garmin, then you might actually prefer using your phone and a HRM. With your smart phone you get instant view of more data, such as GPS data and the likes. In my case I have a Wahoo Blue SC Cycling Speed & Cadence Sensor , which provides me cycling data. But for the most basic of needs, the simplicity of not regularly charging, and the other features– it is hard to argue that the Garmin Vivofit is the better buy over the Fitbit Flex. If you have any specific questions about these two devices let me know. I’m still wearing the Garmin for now to do further testing and comparison, in tandem with my Fitbit. I have been seeking out for reviews on the vivofit because I’m also a little bit of a gadget junkie and that’s one that’s been on my radar but I haven’t quite had a chance to buy and play with yet! thanks for being so thorough. I didn’t realize it didn’t have a vibrate functionality at all… That’s kind of a nice reminder to get moving. I believe the model above this one has the vibration feature. Correct, the new Garmin Vivo Smart Band has added vibration, a lit display, and other notification features. However, unlike the 1-year battery life of the Vivo Fit, the new Vivo Smart battery requires charging weekly. So keep that in mind as you make your selection. What about the sleep tracking features. Any comments on those with these two devices? Sorry but I didn’t review that aspect since I don’t like wearing trackers during sleep. Both offer that feature but I don’t personally care for it. From what I have read myself the data from each is quite similar. I’ve been looking for a device that monitors heart rate as well as the features mentioned above, which is why I’ve been putting off getting the FitBit. 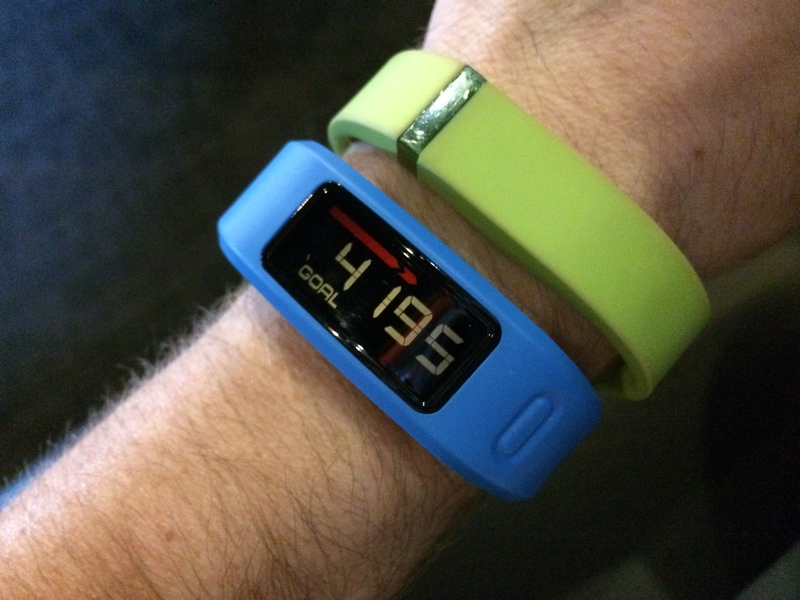 I’m leaning towards the Vivofit Smart Band, which is a model above the one you review here. My question is, would you recommend I purchase the heart rate monitor that works with the Vivofit or does the Wahoo TICKR Run sync with the Vivofit? Both the Vivo devices from Garmin work exclusively with ANT+ protocols I believe (you’ll want to double check this with the new Smart, as I’ve not yet tested that device). In the case of the Wahoo TICKR line of HRM, all of them work on both Bluetooth AND ANT+, giving you the best of both worlds. So to answer your question, yes I would get a Wahoo TICKR Run. However, remember that if you use the Run with the Garmin, you will NOT get any run-quality data. If you want that you’ll need to use the Wahoo app (in my case, testing was done using an iPhone 5/5S). That is the only way to get the most out of your Wahoo HRM. In which case the Garmin having HRM support becomes entirely pointless, because you’ll be using your smart phone to record the workout, not your wrist band (Though you may be able to do both, since one is ANT+ and the other is BT). Hope this helps. Let me know if you need any other data. Thank you for your quick response. These devices are all new to me, so some of this is confusing. I was looking at the Vivosmart for the added features such as the alarm & vibrating mode. The text, email & call alert is a bonus, but not a major selling point. Am I better off getting the Vivofit with the Wahoo Run and just using them separately (two different apps)? That really depends on what you’re doing. And how badly you want the added running feedback from wahoo. It is nice but I don’t personally think it matters (sort of like sleep data– cool but pointless perhaps). My recommendation for bang for buck is the Garmin of your desires (Fit or Smart) — and the basic Wahoo tickr (non run). That’s a good combo of pricing and features. If you want the Run feedback then yes get that device and use smart phone. But still by the activity band whose features best meet your desires. The new Smart band is very nice sounding and is better than most others in segment. I have a few questions regarding the vivo. If using this band to go on a run, what will I need to have with me to track heart rate, calories burned, and distance? I am in search of a band that I can wear and not need my phone with me for anything. With that being said, I still want accurate amount of calories burned and distance and time it took, etc. also, for time in the gym, I want calories burned while working out in the gym as well. What else would I need to purchase, besides the actual band, to make this happen? Wendi, almost any of the wrist-based devices out there do a PRETTY good job when it comes to step-based activities, such as walking/running. They use your age, gender, height, and weight to determine your caloric burn. Accuracy is decent, acceptable for most folks, and if you are doing just step-based activities you would be fine with just a band. However, a more accurate workout can be recorded using a heart rate monitor (HRM). In those cases they can still be used for a walk/run, but will be linked to your heart rate to better calculate the actual caloric burn. That is where the Garmin is nice, in that you can link the HRM directly to the wrist-band. For non-step based cardio-type activities (from yoga to hockey, and so much more) a heart rate monitor is your best option. Since you said you do not want your phone on you, the best option is a wrist device that links direct to your HRM (typically chest-worn, but can also be wrist-based HRMs if you prefer). My TOP pick for that would be either the Garmin Vivosmart, or Garmin Vivofit. However then you’ll also need a heart rate monitor that will work that is ANT+ protocols– you can buy the Garmin devices with a HRM, which makes it easier. There are other options (like the Polar Loop, etc), but the Garmin is my suggested for your application. Hope this helps! I use a GPS Garmin Forerunner for my distance runs/walks. I just put it on when I am ready to do an actual run/walk then take it off after. I wear this to track my distance, time, speed, average speed, best speed, heart rate, calories, etc, but leave my calorie monitoring watch on during the whole day. I have an OLD Garmin Forerunner 305. It is big and bulky, but I love it because it gives me multiple breakdowns and keeps a good amount of history. I am sure Garmin makes better products now that are smaller and do more, but I do not use my smartphone with my workout items because I have a very entry level smart phone and can not hold all the apps many people can hold. I can download my information from my Garmin Forerunner to my computer and track it, but never have. I just really love my Garmin Forerunner for this type of activity. It can also work with cycling too as I have a divide I add to my bicycle which works with the watch. I do not know if this helps, but it works for me as I had the same issue. I wanted something very accurate, and my GPS watch is. I am new to all of this and the wording is still confusing me…. If I want to do P90X style training (so not running) with the VivoFit do I have to buy a separate heart rate monitor to attach to my body or does the bracelet itself have one in it sufficient to get a great calorie burning count? Same question for tracking sleep with the VivoFit – do I need an additional apparatus to do it? To touch on the heart rate monitor question yes for cardio work like P90X a good heart rate monitor will be needed. The Garmin wrist devices (vivosmart and vivofit) do NOT have provisions to monitor your heart in the bracelet. It will require another unit. Make sure whatever brand heart monitor you get supports the Garmin and vice versa. I’m a big fan of the units from Wahoo Fitness. Though Garmin sells their activity trackers bundled with a chest strap if you so desire. If you have any further questions please don’t hesitate to ask. Can you help me.I am really having a hard time trying to decide which one to buy. I do a some running, weights. I need one that measures all of these- heart rate, calorie counter (intake and used), step counter, sync and all the other essentials like distance, sleep, etc. If you want to record heart rate you’ll need to get a separate monitor typically. There are no good units that also measure continuous heart rate, at least not yet. (Tho the new Basis Peak comes out next month and that one unit could do the constant HRM but that is another review for another time). Weights are not really a true caloric burn, at least not from a heart rate monitor standpoint so don’t use one during weights, it won’t be accurate. For running, step counter, the best option is the Vivosmart from Garmin so check out my more recent reviews of that unit. It handles sync, and everything else you want. And you can buy a heart rate monitor to use during cardio based workouts. My top pick is a Garmin Vivosmart, with a compatible heart rate monitor from Wahoo Fitness. The total setup should cost you around $200 approximately but gives you everything you need for all the workouts you mentioned. If you want to record weight lifting, I suggest the app Reps & Sets if you have an iPhone. And if you want to record food intake you’ll need to link your activity tracker with MyFitnessPal. was only possible for about 4 or 5 months. Do you have any “professional insight” as to why Garmin seems to have removed the ability to sync with either MFP or the FitBit website/app? These were the main reason we bought Vivofit, after already owning FitBits. Since Garmin won’t speak to MFP we have gone back to our FitBits. Such a waste! Although I do not have a Garmin device currently hooked up to MFP to give you first hand data, I was able to find what you are speaking of doing a Google search. It appears in the last 30-60 days there has been issues with MFP and Garmin sync. As you can see the service has been down, but is in repair. So while MFP and Garmin are NOT working 100% right now, they are aware, working to fix and resolve ASAP. I’d say don’t give up hope just yet! Both would be fine. Both are water proof. Neither will be of any help during water based activities for accuracy. So it really comes down to your future desires. The flex doesnt do notifications and cant link to a heart monitor. So if you think thats something you may eventually want get the garmin. For basic data rhe flex is still a great unit but it lacks those features and also cannot display the current time. Update: As of 11/13/2014 the prices for the Fitbit Flex and Garmin Vivofit are both $99 … making the Garmin the hands-down winner here! Ari Jay, very good feedback you have provided all those wanting to know which unit to purchase between the Garmin Vivofit and the Fitbit Wrist Band. This past Spring our employer began a Walking For Health Contest and gave all who participated FitBit pedometer that clipped on your belt or waste band. Since this past April to Thanksgiving, I make it a “must do” to do no less tan 10,000 step a day. My Fitbit has become my motivator and best friend. The only problem with the clip on style is that I have lost it (3) times because it works itself loose, fortunately I have found it each time. I do contribute the use of these devices to my motivation of losing (70) lbs. for Christmas this year I now want a wrist style but do not want to lose the accuracy in the recording of the steps. Also it is great getting a weekly report that comes over my computer from Fitbit with the stats. If I am reading your comments correctly, sounds like you are in favor of the Garmin over the Fitbit. I do believe that I will up-grade to a heart monitor. Again, great reviews and they have helped. Thanks and have a Safe & Happy Holiday Season!!!! Jeff– first off, thank you for the kind feedback. Second, congrats on the weight loss achievement! That is great, and I agree having a device like this tends be a great motivator for staying on target, even if just for health reasons, but especially for weight loss goals. Please note that this review, while still accurate/pertinent, was written back in June of this year. Since then a LOT of new devices have come to market. Right now the Garmin Vivofit is on sale for the holidays ($75) making it a great deal. However, Fitbit has released new devices since this article was published, and the new Fitbit Charge is on sale for $99 right now. If you have already spent time in the Fitbit arena, you may find the Garmin Connect software feeling a bit a step in the wrong direction. It just isn’t as wonderful. Also, the auto sync features are missing in the Vivofit, but you can get that in the Vivosmart. I do not believe any of the other software provides you an automatic email weekly report like Fitbit does. Given your track record, I’d probably suggest the Fitbit Charge for $99 if you wanted a wrist tracker that does a lot of great things. Second place would be a Garmin (Vivofit or Vivosmart, depending on what price point and features you wanted). I was hoping reading this would help me decide, but I must admit, still undecided. Do both of these trackers sink with the phone samsung 5? I am a walker and do zumba and I want to keep track of steps and exercise, the reminder to keep moving would be good, since I mostly sit at work. I will admit technically challenged. Now assuming that you’re open to the idea of a heart monitor, be it a chest strap or even an arm band, then the Garmin is your best bet because you wear the Garmin all day long, but when you do your Zumba you would also add a 2nd device, to record heart monitoring, for better workout info. That would be my suggestion if you want to buy something right this moment. HOWEVER… I tend to prefer Fitbit’s layout over Garmin, and given your exercise routines, there is a better option down the road. Rather than spending $80 on a Garmin right now, and then $40-50 on a heart monitor, you can wait a few weeks and in the next 30-60 days the new Fitbit Charge HR is coming. It will have a heart monitor built into the wrist tracker. So when you did Zumba it would do a better job recording you ACTUAL caloric burn there. If you don’t want to spend the $150 that the Charge HR is going to cost, then another idea might be to use the Fitbit Flex right now, but manually enter your Zumba exercise. With the Fitbit app you can go into, and manually log an exercise (start time, duration, type of activity) and it “estimates” the caloric burn data. That always works too. Im torn between both of these products. My issue is mu current phone is not compatible to them. I have a samsung galaxy express and it runs android 4.1.2 so I know its not compatible. Both can be synced to my computer though. Im interested in tracking walking and daily activity so either could work. Do you have a preference on which syncs easier to the computer and which interface is better. Both are optinal when in sync with a phone but will work fine with your computer. Sadly i have no real personal experience going that route but i can say from what limited testing i did there both work nicely. From a computer standpoint they should be quite similar and i would then suggesting getting whichever hardware device you prefer. Both are nice though i personally love the garmin battery life. Thanks for the quick response! Did you feel one was more comfortable than the other to wear? Bulkier? I really want to wear whatever I buy as much as possible. Though the Fitbit Flex was a bit lighter and smaller than the Garmin Vivofit (the Garmin Vivoflex is closer in size to the Fitbit Flex), both all three of those were very comfortable to wear. I would say the Fitbit being marginally lighter/smaller hence marginally more comfortable to wear. I never found any of those three devices bulky or over-bearing. Cheers! Second, I have read numerous reports of the Vivofit falling off wrists due to poor clasp. Have you encountered this issue? See both links above. Short answe is YES your iphone will work just fine for both devices so you are good to go! Hello! Thanks for the detailed and practical review! I wanted to know how I can maximize my Garmin Vivofit when I do circuit training. My movement involves a lot of squats, use of dumbells, jumping and quick footwork step. For a 30 minute activity, it recorded around 2,500 steps. Unofortunately, I do not own the HRM. Sadly these more basic step counting devices are really not able to be maximized for non step based activities. It is a huge short coming, and one I doubt we’ll see resolved any time soon. What is happening in this market segment is that people are often moving to smart watches where you’ll be able to utilize the motion sensors for other activities and record reps & sets- such as with the Microsoft Band or even the new Apple Watch. Additionally there is a device called Atlas coming out that will record all gym activities. The short answer is that for non step based activities with a Garmin Viviofit my suggestion is to buy a $50 chest strap HRM and not wear your wrist band during those workouts. This is your only cheap/easy solution. Hope this helps! I lost the USB dongle that came with the FitBit One. I tried to use my Garmin USB ANT+ dongle instead to sync the FitBit with my Windows 10 laptop, but it did not work. What protocol is FitBit using over the dongle? Is it something proprietary and not ANT+? Again I cannot promise this will work. But worth a shot. Also, try contacting Fitbit customer service. I’ve heard stories of people getting free wall chargers when they lose theirs. Maybe the same gracious customer service exists for your dongle? I am currently wearing both a vivofit2 and a fitbit. At the end of each day they do not match. I have tried entering my stride and still do not match. Did you find the same issue? David, this is ALWAYS the case. You could use two of the same brand devices (like a Fitbit Flex and a Fitbit Charge) and still end up with two different step counters. They are NEVER going to match– sorry, but that is just the nature of the beast. Get used to it! If you want accurate step counting, you’ll need to find a device that is attached to your ankle. That is the only place on your body that is going to match. Your arms swinging are not an indicator you are walking (you can move your arms while standing still, think about that!). So trying to count steps at your wrist is just about the worst, least accurate possible method. However, this is where people are willing to “wear” their devices, and this is also the easiest place to see a screen. So people like Garmin and Fitbit design devices with this in mind. What I tell people is this: don’t look at Brand A vs Brand B for accuracy. If you switch between brands, you’ll need to mostly ignore your steps. Instead, just aim for goals. 10,000 steps per day. Or on a day you know you were lazy, see what it says. And then the next day try to do more. Each step counter should be “accurate” to itself, meaning a more active day versus less active day, the results should be clear on that specific device. Data between brands or even devices within a brand won’t match, but active (high step count) days will show up as a delta, or difference, from lower step (less active) days. Hope this info helps. If you google “step counter accuracy” or similar wording you’ll find TONS of article that discuss this, at length, about how inaccurate these devices are for counting steps. Really, they are best to help motivate you to move, and hopefully you can compare your moving, day versus day, to see if you “shook your wrist” more one day than another!